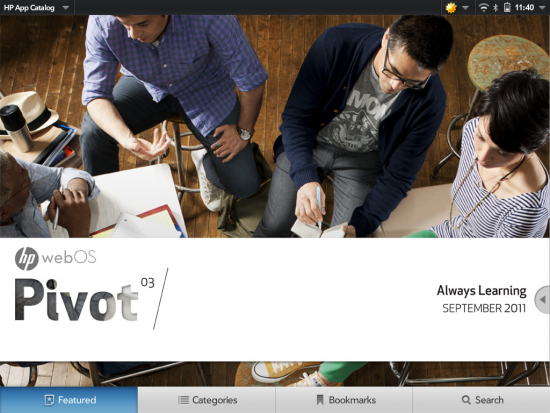 Another edition of webOS Pivot, the exclusive App Catalog Magazine for the HP TouchPad, has been pushed out to devices on schedule this week. In this September issue of the magazine, the Pivot team takes a look at education, learning and the information superhighway (the internet) and how your TouchPad can get you connected with it. As is usually the case with Pivot, this edition will give you a list of books to check out in the Amazon Kindle app to get your fall reading list set. You'll also see 23 total apps shared over 42 pages that cover a multitude of activities and interests. No matter what type of life you live, Pivot will have you covered with finding at least a couple of apps that you will want to download. Whether you're a student who needs to get Study Buddy HD or Pix for your homework, an amateur chemist who likes to have the Periodic Table on hand at all times, or if you just need to watch you caffeine intake to be sure you don't suffer from the affects described in Death By Caffeine HD. Check out webOS Pivot on the HP TouchPad right now by launching the App Catalog and waiting for it to download in the background. Then let us know in the comments; what apps did you download from this issue?